World Football Stars - best slots in the best casinos! 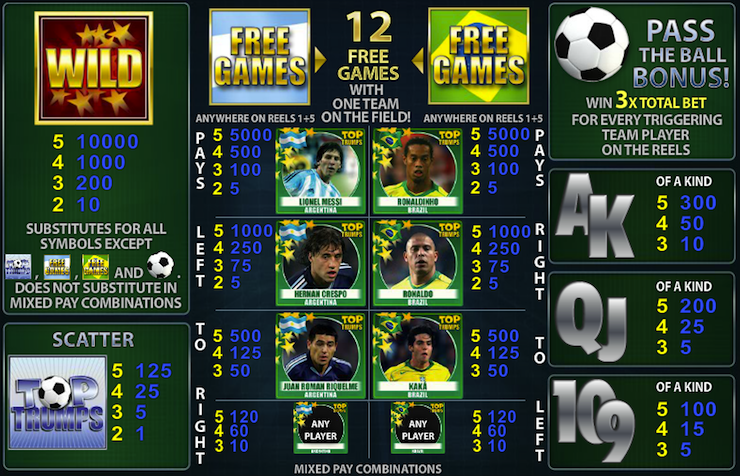 Top Trumps World Football Stars is a slot game featuring more options and gimmicks than you can shake a stick at. With a quirky bonus feature, wild symbols, scatter symbols and the option to gamble your winnings, World Football Stars provides more entertainment for football fans than a World Cup ever could. The theme is very well executed, with players having the option of picking up to seven teams and with three of each of the team's star players showing up everywhere in the game. The sound is also reminiscent of what one would hear at a soccer match, while the graphics are also very solid. The only critique some players might have is that it's a bit of sensory overload, whereas football fans might only be disappointed by the outdated player selection. When you enter the game, you will first be asked to pick your team.You choose two of seven teams to square off against one another. Each team's particular symbols will then appear in the form of its star players. The first team's symbols will be activate from left to right, while the second team's icons will be active from right to left. Then, pick your bet denomination - you can choose anywhere between 1 pence and 5 pounds - and give this 5 reel, 15 pay line game a spin.